A few of our students own and use iPads for school. How are they using them? I asked two of our Freshmen to share their experiences thus far with their iPads. How long have you had your iPad2? J: I got my iPad at the end of 8th grade. Why did you get an iPad and how has your perspective changed now that you've had it for a while? J: I had wanted one to use for flash cards, quick notes, and the calendar. Now that I've had the iPad for a year, I learned about Twitter and Flipboard so I'm using those two apps regularly to keep up with updates and news. ... I'm interested in math, technology, and education, but I've also come to realize that I need a little balance in my life so I added Temple Run and Fruit Ninja to my iPad desktop. ... I didn't know about Facetime and Skype - I will use those to contact friends and family. ... Also, I like to borrow books from the public library that I can download to my iPad. For Spanish class - translator - SayHi - .99 - I like that you can talk it into it. I usually use it to look up the meaning of a word. For English class - ereader - iBooks - free - The Color of Water - I didn't find that there were limitations for annotations. For English class - dictionary - Dictionary.com - free - I like it because it's easy to use. It's the iPad version of the website. How did you go about learning about what was on your iPad? Would you consider the iPad intuitive? J: I read the Quick Manual online. That took about 5 minutes. And I set up my password right away. I went through the settings - it was easy to do. Then I downloaded apps. I went to the App Store and looked for specific subject apps. R: My brother had an iPad, so I kinda knew what it was about. Also, I already had an iPhone, which is similar. Everything is pretty straightforward on the iPad. 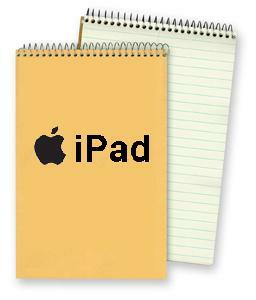 Do you take notes on the iPad? What app do you use? (This question led to a demonstration by both). J: I like using Evernote to take notes in every class. R: I use Notability to take notes. I picked it out right away. I looked at the top 10 apps for Productivity in the App Store and chose Notability. I like the magnifying feature a lot. Ridge decided to get a stylus to use with Notability. His choice? Bamboo. "It's a nice weight and length. It's a little expensive, but worth it." Ridge keeps the stylus separately in his backpack and doesn't find that he needs to keep it with his iPad. Do you have any advice for others considering purchasing an iPad? J: I would definitely recommend it for flash card apps. ... At first, I uploaded bunches of apps, then I realized that I didn't use a lot of them. Now I have a few that I use regularly. R: I would recommend the iPad because it will lighten your load. I now have a small backpack, I don't lose any papers, and I have my work neatly organized. "I'm hooked on it. Life is so much easier for me now."